The FIFA Soccer 08 next-gen gameplay engine, built to maximize the power of Xbox 360 and PLAYSTATION 3, delivers animations and ball control that is so responsive you feel like you are actually on the pitch. Players in FIFA Soccer 08 now benefit from A.I. so smart, it features a 35-point decision engine which enables players to process multiple decisions and reactions in real-time. The A.I. 's dynamic ‘Threat Map’ system captures the excitement and realism of soccer. Players are now aware of their surroundings, reacting authentically to threats and opportunities to make intelligent football decisions. A true next-generation ball-striking engine calculates shot success by combining an almost infinite number of different contexts, including ball spin, pressure from defenders, player attributes, and even air pressure to recreate the drama and unpredictable nature of shooting. A new play mode called Be A Pro locks you in the role of a single player and challenges you to master the same disciplines as a real soccer player—from positioning and tackling to reading the field and passing. 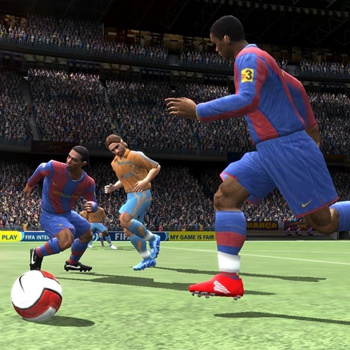 FIFA Soccer 08 introduces skill moves with a true next-generation organic 'building-block' system enabling you to combine tricks and skill moves together to recreate signature moves from the real-world superstars or define your own style of play. Animations can be interrupted at any time to transition into a new move, enabling you to read and respond to the defence, just like real life. Master the skills to break down the defence, elude your marker and lead your team to victory. Represent your club online against your rivals throughout the season in the F.A. Premier League, Bundesliga, French League or Mexican 1st Division. When they play, you play.